Unfortunately, the dress you are looking for (Style: LP-23470, Name: LP-23470) is no longer available. Lace and chiffon combine to make an everlasting statement on this long v-neck formal gown. 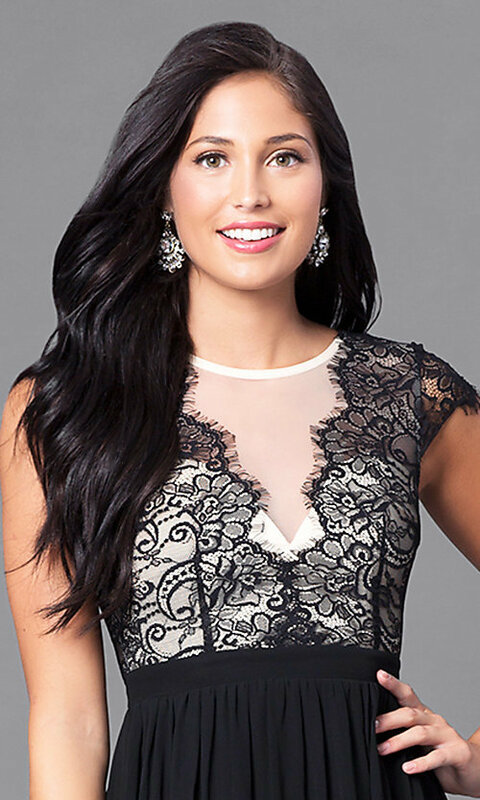 A perfect prom dress with sheer black scalloped lace on the high-neck bodice that elegantly creates the illusion of a low-cut v-neckline at front and back. The romantic style of this cap-sleeve long dress is figure flattering with a black chiffon skirt that gathers at the natural waistline and flows loosely to the floor. This affordable long gown works beautifully as a wedding-guest dress or formal dance party dress.